Welcome to the home of the Professional Ski Patrol Association. The Professional Ski Patrol Association is dedicated to promoting the highest standards of ski patrolling. 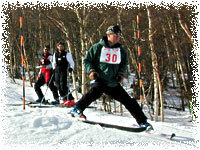 PSPA educates, tests, and certifies patrollers in ski safety, first aid skills, toboggan handling and ski techniques. There was a great turnout at this year’s exam. Thank you to all that put in the effort to ensure a successful event. It was really nice to see those who haven't been able to attend an exam in several years. Four new examiner candidates attended the exam and one member successfully recerted. A very special thank you goes out to Killington and all their staff for being supportive and gracious hosts. Thank you Tait! The conditions were fantastic. Some candidates passed S&T and others passed First Aid. However, one candidate passed everything in her first year! A huge congratulations goes out to Christine Rholl of Sugarloaf for earning her full certification. Well done! The 2018 Annual Meeting was held at McIntyre Ski Area in Manchester NH on Friday October 12. Please see events page for a list of this years events. Remember that day you achieved your PSPA certification? Most likely it came as a result of lots of hard work and training. The process is not simple and requires candidates to push themselves to vastly increase their patrolling skills and knowledge. As a member of PSPA you bring these increased skills back to the patrolling world every day. The strength of the organization is the diversity of its membership. As a member the organization is calling on you to promote PSPA within your respective patrols. Often this may simply mean answering questions about the certification process or pointing the person in the right direction to get information. Motivating and helping others to also strive for certification is the best gift you can give to a fellow patroller.